1.) Show us where you go for quiet. 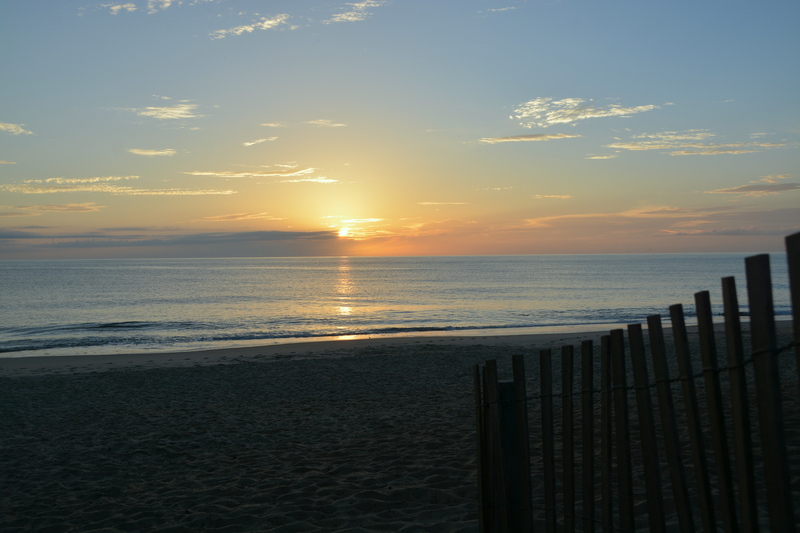 And it should come as no surprise to my readers that my quiet place is the beach, with my Motor Man, preferably around sunrise. Oh, the word in the prompt was “quiet”? Well, then, just never mind the crash of the waves against the shore. And disregard the “chattering” of shore birds. 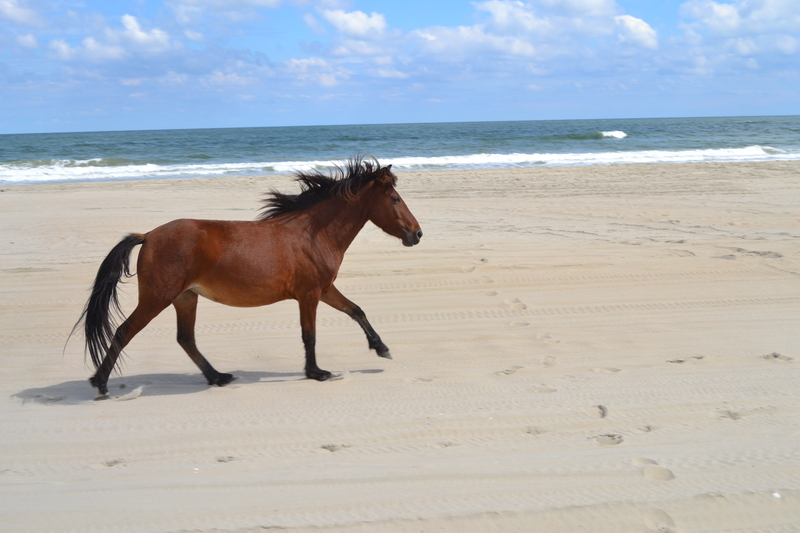 And the occasional soft clopping of horses’ hooves on the sand. Or the crunching of a horse eating sea oats. Now that I think about it, “quiet” can sometimes be a bit overrated. Linking up to Mama Kat’s Writers Workshop. 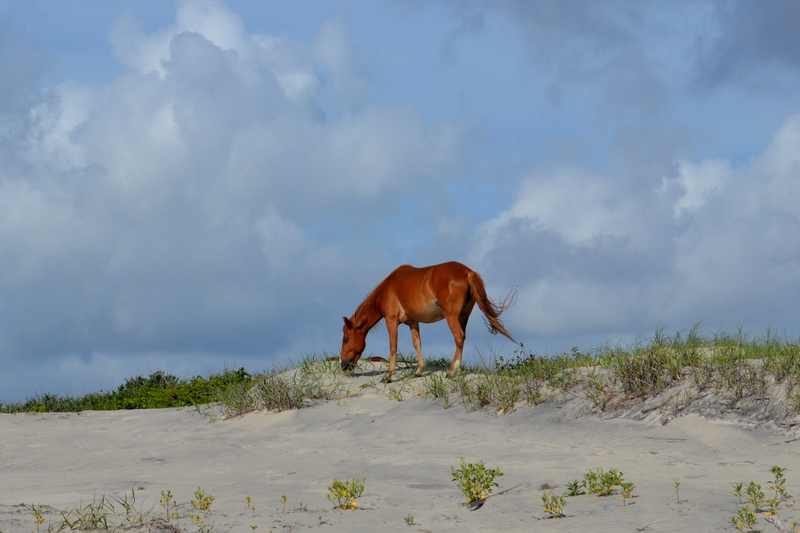 This entry was posted in Family, OBX Wild Horses, Sunrises/Sunsets, Traveling Days and tagged mama kats writers workshop, obx wild horses, where do you go for quiet. Bookmark the permalink. Wonderful thoughts and photos on quiet. I love your “quiet” sounds because they are just different from the ones that surround us during the week. Have a great day, Dianna. The external noise and sounds don’t matter if the beach quiets your soul. Love all the views of your “quiet” place!! I love the beach as well, I can spend hours floating in the ocean and it’s the perfect place to think. Your pictures are beautiful! I think your idea of quiet is one of the best kinds of quiet. When CH and I head to Florida in the winter, your kind of quiet works just fine. When I need some quiet, I hop in my vehicle and drive a country road stopping in the middle of nowhere and just take in the countryside.. I have some favorite spots. When CH and I are looking for quiet, we have a conservation area we drive to and it is beautiful but has a different kind of quiet. Lots of bird chat and critters crunching through the woods, flying critters buzzing. And then there is the quiet under the Oaks on the Tiny Ten. Lots of bird speak and the sound of tiny tinkling chimes and in the Fall the popping of a fire in the chimenea. Perfect pictures Dianna! 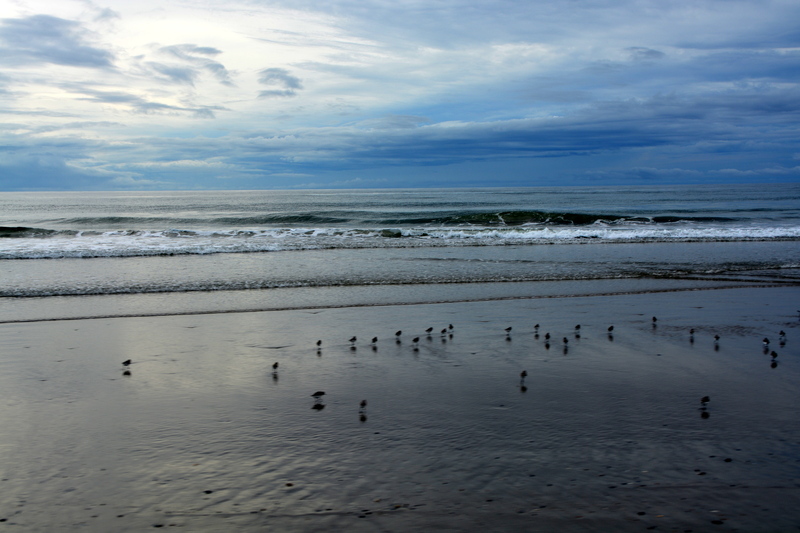 The clouds in the picture of the shore birds are lovely. Pretty photos……I go down to the bench in the woods for my “quiet”……and I overlook the sound of the leaves blowing around in the trees, and the occasional crashing of a deer bounding away through the brush, and the acorns plopping down on the ground as Fall makes its’ inevitable appearance…….Quiet is a relative thing……I find it when I need it WHEREVER I may be. That would be MY pick, too. I also like to sit on the deck and be outside for the “non-quiet” alternative. If I really want quiet I go in my office, close the door and keep the cats out and sit in Chris’s Grandma’s old swan rocker. Perfect. What a wonderful oasis! My quiet is in the garden picking veggies. Some of my best quiet time is there – I know, sounds weird, but the Lord I have some great time together there. My husband ‘complains’ about the quiet at night when all of nature sings – LOVE IT!!! The beach is my quiet place too (and I accidently wrote about it last week:))! And the best times is at sunset! Great pictures. Nice post. My quiet place is on my deck, rocking and looking out at the water. So peaceful. I love this post Dianna! Your beach is quiet in its own way. I think total silence would be awful – like sitting in a vacuum. Me,I head for the deck where there are the sounds of wind in the forest, critters talking to each other, birds in song, insects buzzing, and when the wind comes from the south, the far distant hum of the interstate. And even that last sound can be soothing. Even though there are lots of sounds at the beach, it’s still a wonderful place for quiet as evidenced by your lovely photos. I’d love to sit on a quiet beach (it’s been awhile). I think my quiet place is on my front porch swing. Oh, occasionally there’s a noisy truck or car passing by but it’s still pretty quiet and a place of solitude. Sitting on the beach at sunset. Wow. What an amazing place to relax and let the soul catch a breath. 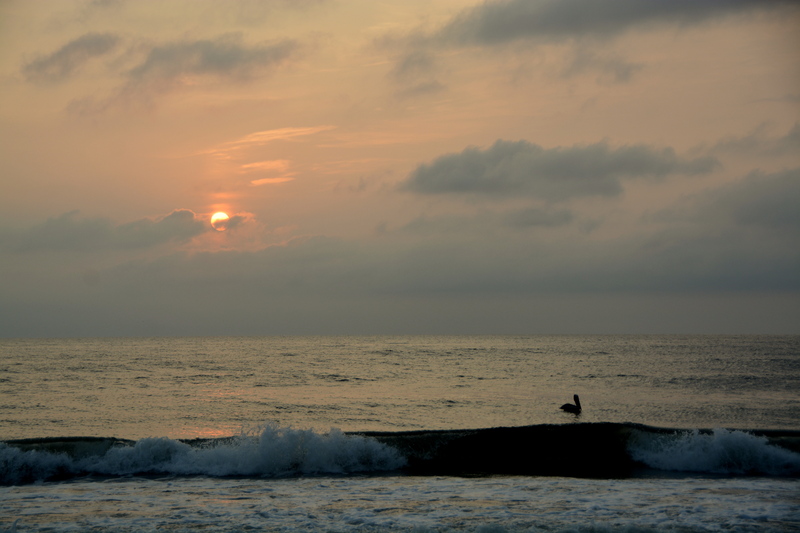 Yes, the Beach at sunrise would be nice. But Oceana NAS is so close. My sanctuary is City Park because it’s on my daily route. Sometimes I have company, though, like a gaggle of 200 geese. Sounds heavenly! I love that kind of quiet. Nature sounds are the best kind of quiet we can experience. It’s creates a place for reflection and introspect. Lovely post. There’s quiet and there’s silence. You’re describing a wonderful type of quiet that is good for the soul. Stunning photos! I just LOVE the horses! I retreat to my upstairs den with my cats–they love it up there. At camp though I used to love going out early to the beach to begin my day before anyone else was out there. There are different levels of quiet in my world. Maybe “peaceful” would have been a better description? I LOVE where you go! If I could, I’d come with you! The beach is a wonderful quiet time. My quiet place I guess would be right before I go to sleep. I feel very peaceful then. I want to go THERE for quiet too! So beautiful!! My quiet is in my bedroom, curled up with my cats and a good book! Oh My…may I please share your quiet place? I promise I won’t make a peep! So beautiful and peaceful. I love the horse!